Thanks daib0. I thought it was, at least, different! 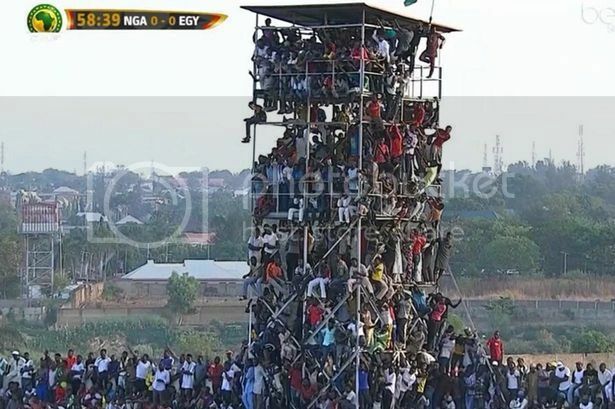 A reported 40,000 spectators crammed into a 25,000 capacity stadium on Friday to see Nigeria take on Egypt in an Africa Cup of Nations qualifier. Former Chelsea player Mohamed Salah scored a late equaliser for Egypt cancelling out Etebo Oghenekaro's opener. It was the first game in which current Blues midfielder John Obi Mikel skippered the Nigerian side. Arsenal star Alex Iwobi made his debut, despite a last-ditch attempt by the FA to keep him available for England. Iwobi played for England at Under-16, U17 and U18 level before choosing to represent Nigeria. He has made 14 Arsenal appearances this season and marked his first Premier League start with his first goal for the club at Everton. Manchester City teenager Kelechi Iheanacho also featured for Nigeria. “Nigeria will most likely be penalised by CAF for poor crowd control even though there was no major incident before, during or after the match,” said a leading football official, who requested anonymity. “Sanctions for such a shortcoming would be a fine and a warning,” he added. Sunday, March 27, 1977. : 583 are killed as two jumbo jets collide on a runway in Tenerife, the Canary Islands. The Canary Islands constitute an archipelago of seven islands in the Atlantic Ocean. They are located off the northwestern coast of Africa and form an autonomous community of Spain. 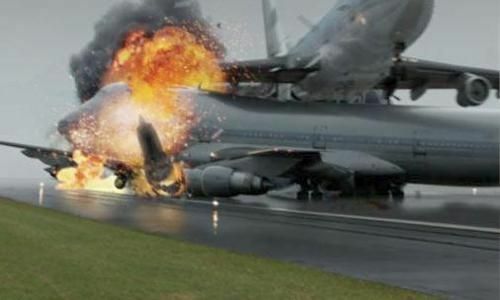 On the evening of 27 March 1977, a Boeing 747 belonging to Dutch national airline KLM, and a Pan American 747 travelling from Los Angeles to the island of Las Palmas, collided on the runway at Los Rodeos airport, Tenerife. Both aircraft, along with at least three others, had been diverted to Tenerife after a terrorist bomb threat closed the airport on nearby Las Palmas. Los Rodeos was a small regional airport, unable to cater for so many large aircraft, having just one runway and one major taxiway parallel to it, as well as several small taxiways connecting them. The diverted aircraft were parked on the long taxiway, meaning that it could not be used for taxiing. Instead, departing aircraft were required to taxi along the runway to position themselves for takeoff. Fog limited the visual range to 300m. The collision occurred when the KLM jumbo preparing for take-off clipped the Pan-Am plane which was taxiing across the runway. The lower fuselage of the KLM plane hit the upper fuselage of the Pan Am plane, ripping apart the centre of the Pan Am jet above the wing. The KLM plane slammed into the ground belly-up 150 m past the point of collision and slid down the runway. 583 people were killed in the resultant explosion and fireball; no-one aboard the KLM jet survived. 335 of the 396 aboard the Pan Am flight survived, including the captain, who was later cleared of any blame. The crash was blamed on the KLM pilot who had not checked if he was clear for take-off. Now to bore you a bit, but I can't resist! On the 27th March 1988, Reading FC won the Simod Cup at Wembley Stadium, beating Luton in the final 4-1! Remember that English teams were banned from Europe and therefore the FA started a new exclusive cup for sides only in the top two leagues. The attendance of 61,470 was then an absolute attendance record for a Reading match. That 4-1 victory remains one of Reading's greatest triumphs. Wednesday, March 30, 1853. : The great artist, Vincent van Gogh, is born. Vincent Willem van Gogh was born on 30 March 1853 in Zundert, in the southern Netherlands. Van Gogh was not recognised for his talent during his lifetime. However, he is posthumously considered one of the greatest and most prolific painters in European history. 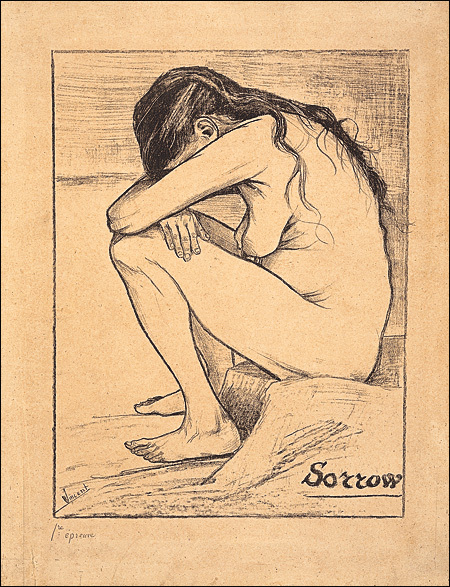 He produced all of his work - some 900 paintings and 1100 drawings - in a ten year period. Van Gogh had an enormous influence on neo-Impressionism, Impressionism and early abstraction, and on many other aspects of 20th-century art. The Van Gogh Museum in Amsterdam is dedicated to Van Gogh's work and that of his contemporaries. Van Gogh suffered a mental breakdown after only ten years working as an artist. The story goes that in December 1888, Van Gogh cut off the lower half of his left ear and took it to a brothel, where he presented it to a prostitute friend. The reason for this unusual behaviour has been theorised upon by many; the most likely cause was that it was the result of an argument with his painter friend Paul Gauguin, although that does not explain his bizarre behaviour. Regardless of the reason, shortly after this incident, van Gogh admitted himself to a mental institution. Two years after this, suffering from severe depression, Van Gogh shot himself in the chest and died two days later, on 29 July, 1890. One of his lesser known works. 1939 – The Heinkel He 100 fighter sets a world airspeed record of 463 mph (745km/h). 1951 – United Nations Security Council Resolution 91 is adopted. 1955 – United Nations Security Council Resolution 107 is adopted. 1981 – U.S. President Ronald Reagan is shot in the chest outside a Washington, D.C., hotel by John Hinckley, Jr. Another two people are wounded at the same time. Now you've got me going. I've driven over that on the wrong side of the road (well, they call it the right side). Thursday, April 2, 1914. : Actor Sir Alec Guinness is born. Alec Guinness was born on 2 April 1914 in London, England. Guinness first worked writing copy for advertising before making his debut at the Old Vic Theatre in 1936 at the age of 22. After serving in World War II, he returned to acting, appearing in Great Expectations (1946), Oliver Twist (1948) and Kind Hearts and Coronets (1949), in which he played 8 different roles. He became one of the most celebrated actors of the 20th century during the 1950s, gaining coveted roles in The Lavender Hill Mob, in which he gained his first Oscar nomination, Bridge On The River Kwai, in which he won the best actor Oscar, and The Horse's Mouth, for which he wrote the Oscar-nominated screenplay. Further films of the '60s and '70s include Lawrence of Arabia, Dr Zhivago and Murder By Death. Younger audiences know Guinness best as Obi-Wan Kenobi in the Star Wars films. Guinness died of liver cancer on 5 August 2000. His wife of 62 years died two months later, also from cancer. 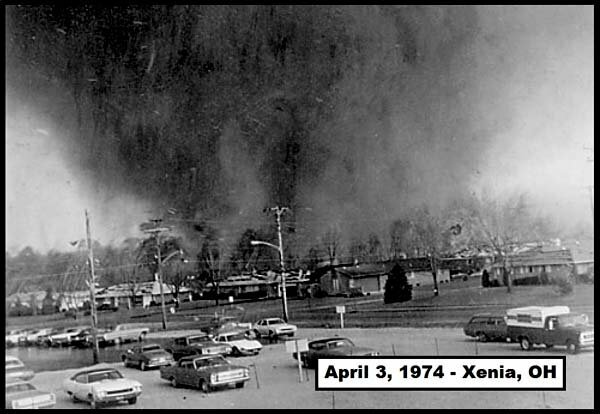 Wednesday, April 3, 1974. : The largest tornado outbreak on record, known as the Super Outbreak, occurs in North America. Tornadoes are violent spinning storms typically shaped like a funnel with the narrow end on the ground. They are extremely destructive and are almost always visible due to water vapour from clouds and debris from the ground. Tornadoes can form in storms all over the world, but they form most famously in a broad area of the American Midwest and South known as Tornado Alley. Early in the afternoon of 3 April 1974, North America experienced the beginnings of a "Super Outbreak" of tornado activity. Over an eighteen hour period, 148 tornadoes hit in 13 states: Illinois, Indiana, Michigan, Ohio, Kentucky, Tennessee, Alabama, Mississippi, Georgia, North Carolina, Virginia, West Virginia and New York. One tornado, the only one to hit outside the United States, hit near Windsor, Ontario, Canada. The outbreak also broke the record for the most violent (F5 and F4) tornadoes, having six F5 tornadoes and 24 F4 tornadoes. Between 315 and 330 fatalities were recorded and another 5,484 people were injured. 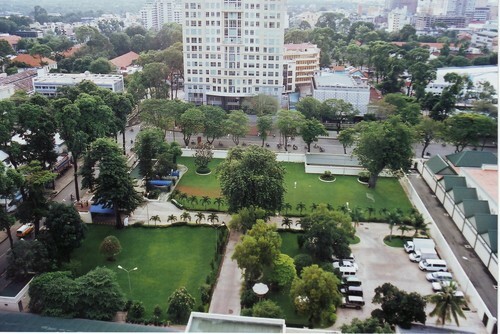 The costs of the damage reached the equivalent of $3.5 billion in 2005 figures.